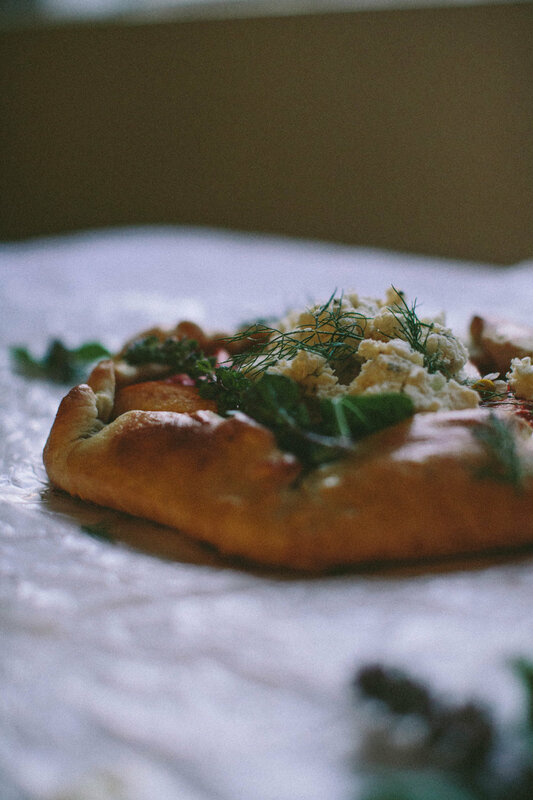 AN HERBED HEIRLOOM TOMATO + STONEFRUIT GALETTE W/ HOMEMADE RICOTTA — The Eternal Child. When I look at this slab of baked heirloom tomatoes and stonefruit the words "Spring is Coming" quickly rings silently in my mind. Yes, we still may have roughly six weeks til that day, but in Los Angeles the warm days and blooming trees say otherwise. Living in a dry desert climate where your average high is 71 degrees and you literally get 284 days of sun a year - you tend to ALWAYS be looking for savory light recipes. I started making Galette's years ago. Not to sound too obnoxious, but as an aesthetically driven human, I simply thought they were adorable. And as a human who loves to host, they were also extremely easy to make. You almost always have all the ingredients in your cabinet and you can mix and match the filling with what you have stocked in your fridge. I have made a baked bree, caramelized onion and fig galette, a wild mushroom and goats cheese galette, a squash galette... the list goes on -- and those are only the savory ones. That's the beauty of the beast, you make one dough crust for both savory and sweet, so you can make dinner and desert all at the same time. How 1950's of us !? This time however, I had heirloom tomatoes on the brain. Those sweet ruby gems literally changed the game for me when it comes to tomatoes. It's like once you have gone heirloom you simply can't go back. Not only are they by far the most beautiful, but the flavor is unreal. I don't know when this became an add for tomatoes, but it did. Anyways... back to this galette. I like many, love the mix of fruit in my savory meals. Maybe it's because I grew up in south Florida, where it was so hot that fruit was always there too cool you off, or maybe it's just that I love me something sweet. Either way, baking some stone fruit - i.e: a peach or nectarine next to the heirloom tomato sounded like a dream. That with some fresh herbs and grated garlic was all I needed, and to be fair, it is perfectly full in flavor simply like that. The ricotta was just an after thought -- and no one is upset about some homemade ricotta. It is actually pretty crazy how simple it is to make this chunky cheese. With 4 simple ingredients it is also kinda hard to mess it up. It is a great thing to make with little ones, because you see the chemical change in the liquid to a curd right before your eyes. I was also pretty impressed, so maybe it is just a cool experience across the board. For this entire recipe we cut everything in half making some savory and some sweet. (the sweet recipe will be up next week, just in time for V-day) For the Savory Ricotta, we added some fresh Garlic, thyme and lemon to flavor it. You will need a large sieve and fine-mesh cheesecloth for this recipe. Line a large sieve with a layer of heavy-duty (fine-mesh) cheesecloth and place it over a large bowl. Place to the side. For the Herbed Ricotta mix in the garlic, herbs and Salt + Pepper to taste. Let sit for at least an hour before serving. The longer it sits and marinates, the fuller the flavor will be. I always think it tastes better day two, so if you are a good planner, try making the ricotta the day before. Preheat the oven to 375°F (190°C). Line a baking sheet pan with parchment paper. Begin by making the crust: In a bowl, bring together the flour, butter, sugar, and salt with your hands until the bits of butter are broken up and the mixture comes together. Begin adding the cold water in segments until the flour mixture binds together and forms a rough ball. Knead the ball until the dough begins to smooth out. Don't overwork the dough. Roll into a ball, and flatten into a disk, wrapping in plastic wrap and chill for at least 30 minutes (can be chilled overnight or frozen for future use). Once it has been chilled, on a floured surface, roll out the dough into a circle about 12 inches (25-cm) in diameter. Gently transfer the dough onto the prepared sheet pan. Next we fill! Begin by drizzling the oil over the surface and using a brush or back of a spoon to evenly cover the surface. Grate the garlic and evenly disperse the fresh herbs and Salt and Pepper to preference. I love a good amount of cracked pepper, so don’t be stingy. Slice the heirloom tomatoes and stone fruit and place them in a small mixing bowl. Lightly cover with garlic olive oil and salt and pepper. Next, layer the pieces of fruit onto the galette - get creative, make it beautiful. Finally we fold in the edges of the dough over the filling, creasing and folding until completing the circle. Brush the dough with the egg wash to get a nice brown crust. Bake for 50 to 60 minutes, checking every 20 minutes. In my experience all ovens are different and only you know how yours bakes. You will know when your galette is done by the golden hue of the crust. Top with a healthy dollop of fresh herbed ricotta and the remaining fresh sprigs of herbs. Serve warm or at room temperature. Makes 1 Galette. I tend to always double the recipe to make an extra galette dough to store in my freezer for a lazy day meal. Always garnish with fresh herbs and edible flowers. Try drizzling some extra Garlic Olive Oil and Balsamic Glaze on top.